I’ve had my eye on backpacks for quite some time. Ever since I saw Mary Kate and Ashley’s crocodile leather backpack from their collection The Row, I knew I wanted one, particularly that exact one, but with a price-tag of $39,000 (circa €31,000), I obviously had to pass. Despite the hefty price the bag actually sold out - if you can believe it, according to Ashley Olsen “it was the first thing that sold off the shelf”. I ENVY everyone who was lucky enough to buy one. As much as I love backpacks, I still don’t know whether to invest in one because I am wary of how much use I will get out of one. Unlike a handbag, which you can pretty much swing over your shoulder for any occasion, a backpack is more like a piece of jewellery or clothing - it is definitely more of a statement piece. If I was to purchase a backpack, there are a few I would like. 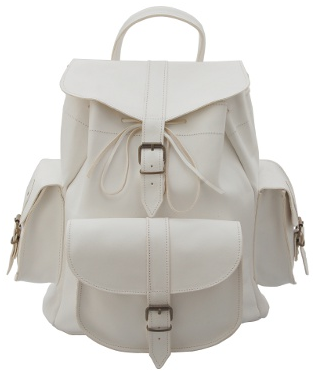 However, my favourite one on the ‘affordable’ scale is this white leather Grafea rucksack, known as the ‘Bianca’. This rucksack is definitely on the higher price range that I would be willing to pay for such a bag, retailing at £160 (circa €200), but it is a quality product that is sure to last you a lifetime. I have been lusting over this bag for months; I love it (nearly as much as the crocodile one).